On last Friday’s #HITsm tweet chat, over 100 participants shared hundreds of ideas, tip and thoughts for “Maximizing your #HIMSS17 Experience – Whether AttendingPhysically or Virtually.” In a previous post, I shared the Stand Out Topics, Technologies, Presentations & Exhibitors chat participants expect to find at the HIMSS conference. Topic #2: What are the 2 or 3 top things you hope to leave #HIMSS17 with and how will you use them to create value after the event? Also excited about some new perspective into use of #HIT for #Medicaid populations. Foresee lots of potential in this area! #HIMSS17 goals: Ways to better doctor-patient relationship & partner w/ my providers for my care. Time to empower the patients! Want 2C proven solutions from consumer applied to #healthtech. Enable Dr. Mom, already! It's what she expects & needs. Meeting People & Taking Pictures to Prove It! #HIMSS17 is all about relationships to me. I hope to leave with dozens of new relationships and dozens of deeper ones. Information & contacts from a short list of companies w/ products & services related to my areas of interest. New partnerships and friendships with people like me who are crazy in love with #helpingpeople, #healthcare, & #HIT!! A short list of firms that I (or my clients) might be able to emulate in some way and/or possibly establish a relationship with. Insight into firms I consider to be competitors of clients I'm doing projects for and for my own professional curiosity. 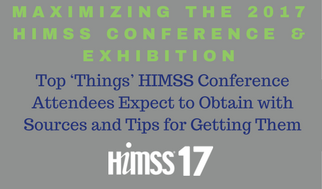 Topic #3: What are your favorite sources & tips for getting the most out of your physical or virtual attendance at the #HIMSS17 Conference? Favorite source for getting most out of #HIMSS17 – Twitter, of course, plus on the floor of interop showcase! Tip: Check out smaller firms and first time #HIMSS17 exhibitors w/ tables/booths around periphery – off the beaten path. Plus, they are usually located close to the bathrooms, exits, and food setups! YES! This is my favorite area to start in the exhibit hall! Always amazed that there aren't more people exploring there! #HIMSS17 Tip I follow: Plan 75% of my schedule & stick with it to the best of my ability. 25% wandering for serendipity. Advize will be making a few vlogs on #HIMSS17 happenings, and posting them on various social media channels. @HealthcareScene always provides a wealth of information! @HealthITNews and @MandiBPro are always beneficial follows. I thought @MMaxwellStroud's Blog piece was spot on! Some other general tips: Make sure to pack spare battery power and comfy shoes are a MUST. Extension cord & MiFi are a huge plus. I'll be in the booth virtually the entire time so I'm just hoping for good conversations. If remote, can also add benefit by linking to materials that bolster the convo. Allows meaningful contribution. Accounts that don’t flood my #HIMSS17 stream w/ tweets full of vendor-speak and “me-too’ information are favs. No need to re-invent the wheel. What made sense in previous conferences makes sense now. See here. The #HIMSS17 Survival Guide is a great resource. Also, download the app & grab a pocket guide. The @HealthITNews team is churning out great content. Keep up w/ all things #HIMSS17 by bookmarking this page. For more ideas, tips and thoughts about maximizing the value of the 2017 HIMSS Conference & Exhibition, check back here over the next few days and consider following me and @ShimCode and @HITConfGuy on Twitter.